There’s been a lot of interest in how I meal plan and grocery shop, so I wanted to share some of the tips I’ve found helpful for us to stay on budget but still have enjoyable meals. This really all started before we got married, but I lacked the discipline to stay on budget…why? Because I love food! I would have an idea of what I wanted to cook and what I needed, but I just made a list of items, not first determining what meals we wanted for the week. This causes all kinds of squirrel moments and new ideas in the midst of shopping. What was the result? Buying things we already had and overspending EVERY TIME! With my new process, this occurs only on a rare occasion and we can seamlessly navigate the store without getting off course. So, what do we do? Let’s get into it! This should be common sense right? Since this is the very premise of the post, but common sense ain’t so common (yep I said ain’t!). You may think you are being planful, but if you still find yourself wasting and not sticking to the meal plan, something is broken in your process. Here’s how I kicked off my planning process that feeds into everything else. Before you set out to shop or even put your meal plan together, list out your staple recipes. These are always good to layer in between new things you may try within any given week. For us, these are meals like spaghetti, tacos, pizza, quinoa bowl, etc. We pretty much already have elements of each of these meals at home like spaghetti noodles, tomato sauce, and taco seasoning. Then, do your research and look for some new recipes you may want to try. I love experimenting with new dishes and then adapting them to what we like. When you plan far enough in advance, you can make this happen very easily. Try mixing things up between your staples and new recipes. It will help keep you from being bored with your meal prep and deciding to eat out (this will happen regardless but the frequency will hopefully reduce down to special occasions only). Pinterest, Google, and YouTube are your friends! I have a handy dandy Microsoft Word doc I adapted from a template I found online through their website. It maps out every day of the week and I breakdown the meals for each day from breakfast to dinner, even if I have some specific snacks that need prepped. This allows me to start out by determining which meals to make on what days and I can easily see the number of meals, leftovers, etc. Once I determine what we will eat for the week, off to the side I have a list of stores I frequent and the items needed from each place for the meals and snacks. This takes out most of the element of surprise while grocery shopping. I say most, because there are still those 1-2 must haves that you either miss or see and instantly crave (can’t deprive yourself of the little pleasures ALL THE TIMEJ). Also, try ordering the items by where they are typically found in the store. This reduces the constant back and forth between areas. Once you get a good sense of your weekly items, you can jot down the estimated cost to guide your decisions even further. Ultimately, you should not pick any combination of meals and snacks that will put you over budget. Take this with you on your shopping trip, printed out so that you can make real-time notes. I have a little folder with a clipboard to keep the list and our receipts as we shop. Cross out items as you put them in your cart, jot down the actual cost, do the math in store to make sure you are staying within budget. Write-in items you get on the fly and their cost so that you know if something has to go it’s the impulse buy! Put it in the budget for the next time if it’s really important to you. This is something personal but still highly advised. Grocery shopping is exhausting! Most times, our needs are not met by one store, so we’re hitting up 2-3 in close proximity. Unless this happens in the morning, which 9/10 times it doesn’t for me, I don’t have the energy to shop, prep everything, and then cook. Our game plan is to shop Fridays after work, and then I will meal prep Saturday or Sunday. One thing I am working on, regardless of when we shop, is washing and properly storing items before putting them away so that they stay fresh. Work in progress! This one is easy! Have your meals prepped all the way through dinner if you want. Make it easy to grab and go. Be amazed by how much time you save on the front-end that can be spent doing things you sincerely care about. I started out with plastic containers but have since switched to glass, for the most part. Here are some recommendations I have from Amazon. Now it’s time to put it all together and just DO IT! Planning is the hardest part but becomes routine and seamless with time. You’ve got your repository of recipes? CHECK! 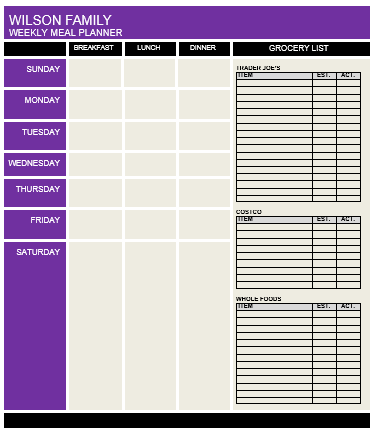 Meal plan printed with needs for each recipe? CHECK! Let’s shop! Get out there and give it try. Again, take a hardcopy list with you and make notes as you go. Shopping for you and your spouse? Make it a date! Remember only to go to the areas of the store that are absolutely necessary. There is no need to snake every single aisle if they contain items that are not on your list. Resist the rise of impulse and take control of your budget! You’ve got this! Ok, it’s over. How did it go? Does this process work for you? What did you learn about yourself? After you do this a few times (yes you need to do it a few times if you want to stick to it and create a habit), evaluate how things are going and make changes as you see fit. Take a look at what you’ve budgeted vs. what you’ve spent. Are you on target as planned? Don’t just evaluate the process though. Did you actually meal prep everything? What went really well and where did you struggle? What things are you wasting? There are so many more questions I can think of but you get the point. Nothing is ever perfect but you can make it perfectly your own. Continue to refine and repeat the process over time. You don’t have to just do this for your budget’s sake. How about your health? Maybe the goal is better budgeting and healthier eating. This is what we are trying to accomplish. Eating less processed foods and cooking with ingredients we know and can pronounce. Keep in mind, the first few times may be the most expensive, if you also intend to buy some bulk staple products like rice, quinoa, and other dry goods. Space out the need for replenishment so that it doesn’t overwhelm your budget.